The last day of filing tax returns, 31 July, isn’t far away and if you are one of those who wait until the last minute, you aren’t alone. Every year in July, there is a last-minute scramble among assesses to file income tax returns. With the current trend where taxpayers choose to efile their return at last moment, quite often the Income Tax Department’s servers get overloaded. Filing your return is actually an extremely over-rated task. Till recently, the thought of filing income tax returns conjured up a sight of never-ending queues and complicated forms. But now even with the fast approaching deadline of July 31, one can continue with their daily routine. That’s because the income tax department has come up with an online platform (Income Tax efiling) through which the entire process of tax-paying becomes more transparent and less stressful. The government is getting strict with returns. Till now, individuals were not placed under so much scrutiny but with recent changes, the scrutiny is likely to increase. This time the focus seems to have shifted from simplification to compliance and transparency, which means there will be more details and information to be revealed in the form. However, if you stay updated with some of basic tax gyaan, then even filing at the last minute will be hassle-free. There are different forms that need to be filed on the basis of sources of income. ITR 2C and ITR 2E is applicable to an individual having no income other than salary / pension and interest. For individuals, who have other income such as house property or capital gains but no business / profession income, ITR-2B is appropriate. A partner in a partnership firm would be required to file ITR-3. ITR 4 is applicable to individuals with income from business/profession. Here’s a list of the documents you need to keep handy when filling the form, physically or online. Permanent Account Number (PAN) is unique alphanumeric combination issued to all entities under the Indian Income Tax Act. It is undoubtedly the most important number to be filled in. Your name in the return form should be accurate, it should match with the one appearing on the PAN card. You would need to mention this number only if you have paid extra tax and are expecting a refund. Form 16 is the document proof given by an employer to all its employees with the complete details of income (salary), the amount deducted as income tax (TDS) for each month and the total tax payment. Most of you would have received your Form 16 for FY12 from your employer already. If you’ve changed jobs during this period, you need to collect Form 16 from both present as well as earlier employer. You will first have to get form 16 A collected from the parties who have deducted tax while making payment to you during the year. This includes banks and companies (with whom you have kept fixed deposits), parties to whom you have given loan, tenant to whom you have rented your property. This certificate also mentions the income you have earned from sources apart from your salary. If your salary package includes benefits, such as holiday expenses, credit card expenses and the like, you would need details of this form, which too will be provided by your employer. Form 12 BA gives the details of perquisites, fringe benefits or amenities and profits you receive in lieu of salary. Receipts of life insurance premiums, National Savings Certificates documents, Public Provident Fund passbook updated until 31 March 2012 that also mentions the interest received, statements of tax-saving mutual funds and receipts for tuition fees and others. Receipts for pension plans you have invested in. Receipt of investment made in infrastructure bonds in FY12. Receipts of payments in the National Pension System. If you’ve made capital gains, either long-term or short-term on shares and property, you need to mention the details of these too in the tax return form. Though long-term capital gains are not taxable for equity mutual funds and shares, you would need to mention the details in any case. If you have a home loan running, your bank must have given you a certificate for the interest and principal repayment on your loan. If you’ve paid any advance tax during the financial year, keep the challans or receipts handy. You will need to fill in the date of credit into the government account and the serial number of challan along with the amount. Now, incorporate all the data in your tax return form, do review some obvious questions like gender, residential status, PAN number, original or revised return before generating the XML file. Now log in to your account on the income tax website and upload the XML file on the site. After you press the upload button, an acknowledgement in the form ITR-V will appear on the screen. Download this acknowledgement on to your desktop. 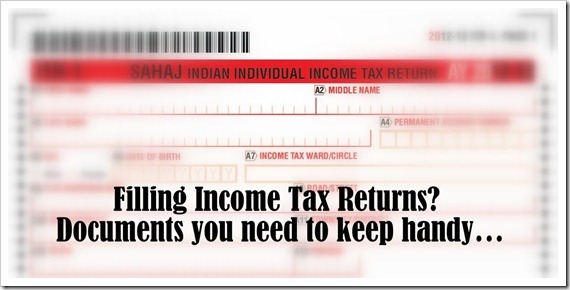 Take the print-out of this ITR-V to send to the tax officials at CPC – Bangalore. The due date for submission of the signed ITR-V is 120 days from the date of uploading the income-tax return form. ITR-V has to be sent by speed post or ordinary post only. Registered post or courier is not accepted. So there you have it – All the documents and information that you need for filing your tax returns. Its not that difficult after all! If you have any questions regarding tax return filing, do drop in a comment. "Filing Income Tax Returns? Documents You Need...", 5 out of 5 based on 1 ratings. can a salaried person use their ITR (salary) in opening of a new firm ? This is really an informational article on e-filing. This service is really convenient and has helped me. I read this article on e-filing and followed their step by step guide to file returns. Its very easy and i am very satisfied. Would like to share the same with you. Hope it adds value to your post. if I left a job in 2010, do I need to ask for form16 to that employer, or its just for financial year 2012 onwards. Hi.. information is very clear. there r few doubts. Im working in a company and started a partnership firm, but not earning from it till now. will I required to file both ITR 1 and ITR 3. or ITR 3 only enough.